The 21st century is an uncertain place. Natural disasters, terrorism or industrial accidents can turn everything upside down at a moment’s notice. The lessons of disasters like Hurricane Katrina or 911 is that in such events, people in the affected area will be on their own for some time. It may be a few hours, or it may be days or even weeks before normalcy can restored. During that time, power may be out, stores may be closed (or their shelves may have been quickly emptied), and it may be some time before the authorities can restore even basic services. Having a ready supply of food at hand can make the difference between an uncomfortable situation – and a harrowing, or even deadly, one. Emergency food supplies should meet a number of basic requirements. First, they should last a long time, so one can purchase them and store them away for use when necessary. Normal canned goods have a shelf life of a couple of years, sometimes less: eating food out of cans after their expiration date means gambling with one’s health. The food supply should be portable: in some cases one may need to evacuate to a safer location, and being able to take food along can make all the difference in the world. Also, the ability to heat meals when the power is out can be very useful. In an urban setting, starting fires to cook is incredibly hazardous, doubly so in a disaster situation where a fire may burn out of control because emergency personnel are otherwise engaged. Variety and quality are not essential, but in a situation where one may need to rely on emergency stores for several days, those qualities can help keep morale up during what will be a nerve-wracking and stressful time. How much food should one have on hand? Government guidelines suggest a minimum of one week. This is one week per person in the household, and one should keep in mind some emergencies may lead to disruptions of regular supply chains for much longer than that. The current model of “just in time” inventories mean stores and supermarkets only have a few days’ worth of food available, and depend on daily supply runs from trucks and trains to keep their shelves stocked. In a major emergency, those trucks and trains will not be around. The government may step in and hand out emergency supplies, but at best that means surviving on whatever the authorities can scrounge up. At worst you have the prospect of going days or even weeks without any food. A week’s supply is only enough for short-term emergencies. A 30-90 day supply, on the other hand, ensures that all basic needs will be met for most emergencies. At the very least, 3-7 days basic supplies should always be ready at hand, as well as enough food for a longer period. Lack of potable water will kill in a matter of days, so at a minimum one should have 3-7 days worth of water available. Ideally, one should plan on having a week’s supply of water and 90 days’ worth of food. Food supplies can be built upon gradually, another place where a long shelf life is important. Readystore products are ideal emergency food supplies. MREs (Meals Ready to Eat) have a shelf life of five years and come in a variety of flavors. They do not need heating but can be heated if power is available. A 90-day supply can be thrown in the trunk of a car, enough food to handle most emergency situation. Readystore’s 90-day MRE package provides 2,000 calories a day, can be stored for years without loving flavor or quality, and can be eaten as-is, without needing to heat them. The 3-day or 1-week Self-Heating and Water Supply packages are ideal for short-term emergencies, providing all one needs to survive for three days, or even more if food is rationed. The ability to heat meals without relying on power supplies or hazardous fires means one can enjoy the comforts of civilization even during a major disruption. A combination of these 3-day or 1-week packages and a larger supply of MREs provides the ability to handle almost any situation where services and food supply are disrupted for several days. Known for providing high-quality survival supplies, Readystore can provide everything an individual or family would need to weather most kinds of disasters. At a time when stores may be looted or shut down, and the government may prove to be slow and inefficient in its response, one should be prepared to assume responsibility for one’s survival. 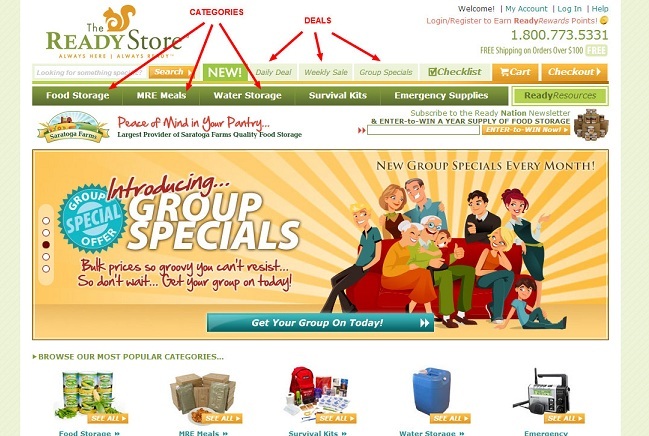 Readystore’s products are reasonably priced and are worth the expense. One should think of emergency food supplies as a form of insurance. Instead of regular insurance, the payoff in case of an emergency will be immediate and possibly life-saving.